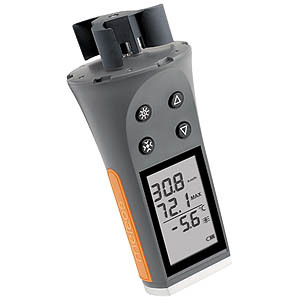 The Skywatch Meteos is an anemometer with a 54mm impeller which measures wind strength without worrying about its position. The display is made up 99.9 at the 10th, then to the unit. Polyethylene protection foam makes it comfortable to hold. Energized by two replaceable AA batteries. Aluminium base with a thread allows its mount on a camera tripod. Units: km/h, mph, m/s, fps, knots and bft. Resolution: at the 10th up to 99.9, then to the unit.